The BIGGEST & The BEST CHARITY in ENGLAND & WALES! Providing the Most ESSENTIAL Advice & Information on Canine Stretching Massage & Good Rescue Dog Health! How to improve the quality of your rescue dog's life! By Jörn Oleby. Many dog owners invest considerable time in activating their dogs by obedience training, seeking activities, tracking and protection exercises at training grounds, out in the countryside or in the forest. These activities allow us to spend time with our dogs while also keeping them physically and mentally alert. Others, such as the police and rescue teams, use dogs at work. We expect these dogs to have a well-developed physique to be able to perform the work they are trained to do. A lot of time and money is spent on training a clever and efficient dog. There is considerable research and many opinions on the topics of what food and exercise is best for our dogs. We all have the animals’ best at heart. Good care and healthy food is thought to be essential. No matter how well we take care of our dogs, disease and injuries do still occur. If the injury is related to the muscles, tendons, joints or ligaments a vet or physiotherapist can help. If there is a defect in the hip or elbow joints and in cases caused by unhealthy breeding, the only treatment available is pain relief. As dog owners there is nothing we can do to repair problems related to unhealthy breeding nor can we prevent all accidents. However we can prevent muscle related problems and strain injuries by massaging and stretching our dogs regularly. This keeps the dog well-balanced physically and psychologically, allowing it to retain the agility of the young dog to an advanced age. Short and stiff muscles is something that we ourselves and our dogs can suffer from if we don’t take care of our physical condition. Another illness that might reduce our dogs mobility is Arthrosis, and is usually formed of fibrous connective tissue and cartilage and is very common in older persons or dogs, especially affecting weight-bearing joints. Articular cartilage becomes soft, frayed and thinned. But also younger persons or dogs might get Arthrosis due to genetic reasons, injuries or the combination of overweight and too little exercise. A common symptom of Arthrosis is stiffness and lameness. Massage relaxes the muscles and is an excellent way of letting your dog winding down after a long jogging or cycling session. And it is enjoyable! Warming up before activity has a preventative effect and stretching is just as effective after the dog has used its muscles. The dog should have warmed up and exercised before you start to stretch the muscles and I recommend that you allow your dog to wind down after physical exertion. Let the dog walk for a while on the lead in the same way a race horse runs an extra lap at half the pace to round off the race. This helps to remove lactic acid and waste products. 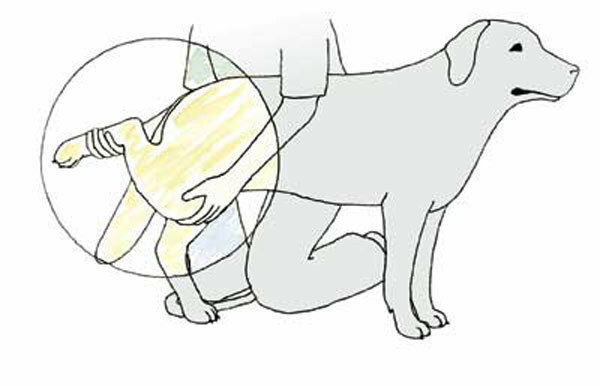 As with massage it is important that the dog is relaxed before you start this treatment. Warming up can involve walking with the dog on the lead for 15 to 20 minutes before allowing it to run freely. In this way the muscles soften up and are ready for physical activity. Competitive or working dogs should warm up in a more goal-oriented way. First remember that the dog should have warmed up and exercised before starting a mission or an active session. I also strongly recommend that you allow your dog to wind down after a mission or an active session before any stretching activities. Here is a check list that could be used before a mission or active session. Let the dog trot for 2-3 minutes. Warming up does not tire the dog but rather increases blood circulation and warm up the muscles ensuring that the joints are lubricated and more supple. The dog is now ready to perform. 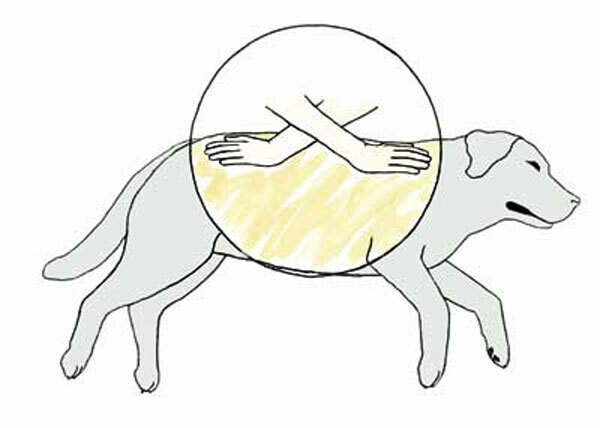 After the warm up you could also easily test your dog's mobility using the eight most common stretching techniques. 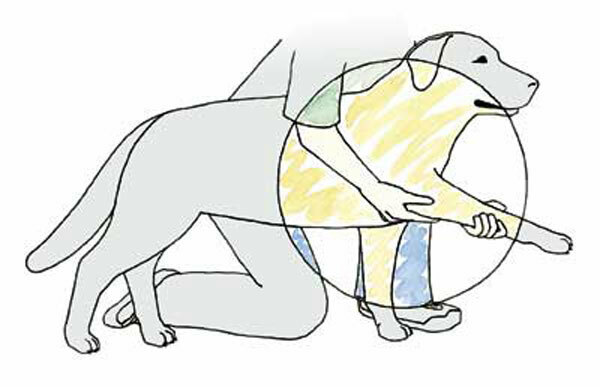 You should be sensitive to your dog's signals. The dog should not experience any discomfort. If it does, don't hesitate to contact the vet. After completing a mission or an active session let the dog wind down and then carefully do some stretching exercises. And when you come home reward the dog with massage and you will get a happy performing dog ready for new challenges. Jörn Oleby, author of the book ”Canine Massage and Stretching – A Dog Owners Manual. Pictures used from the book.